Having locs now is a confirmation that I am not my hair and that my appearance does not define my character. As much as I think the hair you have could give a lens to the type of person you are, I still believe that hair is just hair (and can be changed, twisted, manipulated for the godddddssss as much as it wants) and doesn't have to define you. They say when you look good, you feel good, right? Well, what if you don't think you look good? Or what if your definition of self-beauty is in just as transformative a state as the hairs on your head? I've learned that no matter what you're feeling about yourself at a given time, life continues. 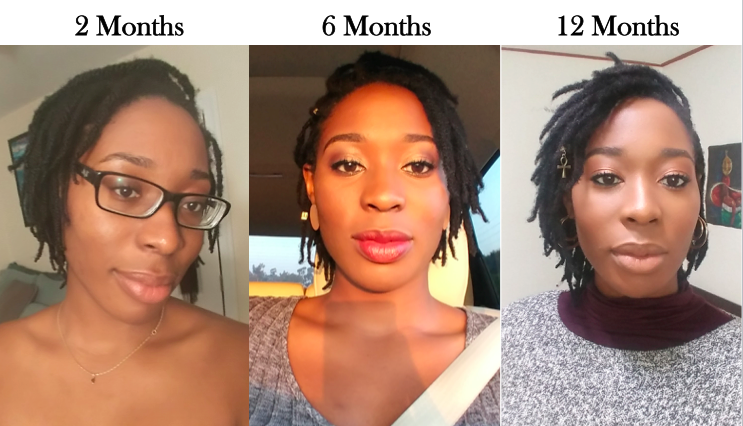 I started my locs when I was transitioning jobs - and as a black woman in America with no professional clout, I worried about how my thin and scant two-strand twists would affect me in interviews and in starting in a new office space. I decided to let my personality speak for who I was and my work speak for why I was there. I was uncomfortable in my new hair initially, yes, but I resolved to smiling through the discomfort and not letting this newness distract me from my goals. Similar to smiling through the "pain," during the initial stages of my loc-hood (lol), there was nothing I could do but T the P (trust the process) and allow my hair to do what hair naturally does - grow. While she was doing her thing, it was time for me to focus on my growth as well. This is when I started crocheting, seriously thinking about my near future and what I wanted it to look like, and who I wanted to be as a woman in this world. This is not to say that you can't develop your personal characteristics while your hair isn't transitioning (in fact, we should always be doing that, no? ), it's to speak on the idea of self-growth and the silver lining of transitioning. There's time and space for you to work hard/smart and emerge a better version of yourself. What was most surprising to me when I initially began my loc journey was how much less I was being hit on because my hair wasn't touching my bum bum (or hardly the nape of my neck, even). Surprising initially, but shortly after, it became a breath of fresh air. All my interactions from then on were more authentic and had less to do with my appearance. Anyone who I talked to or dated knew my hair wasn't packed with oodles of bundles or synthetic extensions (again, nothing wrong with either of those - I used to be a proponent of both). What they saw was what they got. I didn't have to sift through people who wanted me on their arm only because of what I looked like; my hair did all the work for me. It's probably that I just think far more deeply now (much to the exasperation of myself and others at times) compared to when I was a late-teen, but I've started to see beauty in a different way. As I was only into fashion and aesthetics growing up, the physical was near all that mattered to me. That's since changed and so has my perception of so many things. This loc journey has forced me to see who I am from the inside-out. With other people, now, I habitually assess their beauty from the kind of person they present themselves to be, not just what they look like externally. Beauty is way more than skin-deep.